Live the legend of the Tour de France by riding on the same routes as the professional cyclists like Chris Froome and Bradley Wiggins. 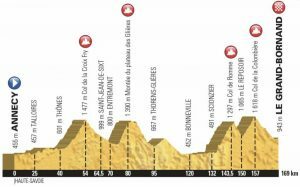 Every year the Etape du Tour invite the general public to ride one of the mountain stages of the Tour de France: the same stage towns, the same routes and the same mythical climbs. The 28th edition of L’Etape du Tour takes place on Sunday 8th July 2018 with a peleton of over 15,000 participants. L’Étape du Tour is now Europe’s benchmark cyclosportive event. L’Étape du Tour is obviously an immense sporting challenge. But it is also a tourist adventure which will enable you to discover some of the most beautiful parts of France, and what better place to start than the stunning Lake Annecy.